Tempered glass is very “tough”, it is also known as toughen glass. The regular glass which you are acquainted with is called “annealed” glass. “Annealed” glass can be very dangerous and you will often see this type of glass in old fashioned windows and such. Tempered glass is very strong, like “Coca Cola” bottles, and even stronger now with new improved innovations, it also has a more chic and streamline appearance. If an object is hurled at tempered glass, it will most likely only receive a chip, which can be repaired. If a force were powerful enough to actually cause breakage, it would be broken into safety glass type pieces. You can really see an improvement when using tempered glass in automobile windshields. Unlike the old windshield glass of the past, it breaks (shatters) almost into one piece which could actually be picked up as almost whole and tossed away in the trash receptacle. You will see tempered glass used in products such as we have here at MyColourGlass, and other home decor items. The tops of patio tables and other furnishing are often made with tempered glass for increased durability in usage. All of the products at MyColourGlass use toughen glass (tempered glass). Compression is what makes the glass so strong. A few of the choices in using tempered glass in your decor are as follows. Kitchen & Bath Splashbacks– Kitchen and bathroom splashbacks are the perfect candidates for tempered glass. 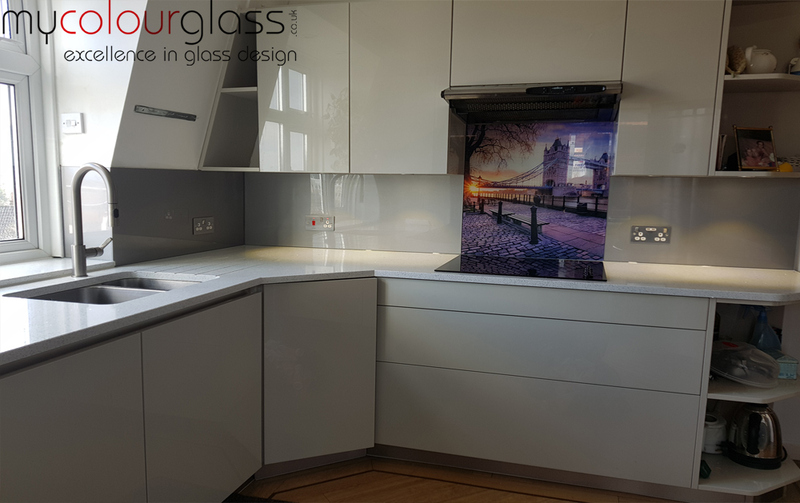 Tempered glass splashbacks are easy to clean and also very durable at the same time. You can get them in almost any colour, and even apply high-resolution printing for the ultimate splashback in your kitchen or wash area. Wall Cladding & Panels– Wall cladding (tempered glass custom cut to fit your walls) is all of the rage for a beautiful designer touch to your living quarters or office area. There is no need to worry about appliance plug ins, such as for your computer and such, because we custom cut & fit especially for your layout and design needs. The tempered glass panels are also nice where ever you want to place them. We at MYColourGlass can even match a sample perfectly in your colour choice. Room Dividers & Wall Partitions– Wall partitions and room dividers look really hot when it comes to your decor. You can use these anywhere. You have most likely seen the nice smoke colored, and tinted glass partitions in conference rooms and other businesses. You can also apply these in your personal decor for the ultimate of designer choices. Doors– Doors made of tempered glass are especially nice rather it is for your entry way, an interior door, or even for your glass frameless shower. Glass frameless showers are absolutely beautiful with all of the shades and tints on the market. You really ought to check into these for the most in contemporary design. If you are considering employing glass work in your home or business you will definitely want to check out the products and designs we offer at MyColourGlass. Tempered glass can be used on the interior, or the exterior of your home or business.